Four Arab states have urged their citizens to leave Lebanon amid signs that the conflict in Syria is spilling over into its western neighbour. Saudi Arabia, the United Arab Emirates (UAE), Qatar and Kuwait urged immediate action after a string of kidnappings of Sunni Muslims by a powerful Shia clan. Meanwhile, a summit of Islamic countries meeting in Mecca has suspended Syria's membership. The Organisation of Islamic Co-operation's secretary-general, Ekmeleddin Ihsanoglu, said the body had no room for a regime that kills its own people. Among those reported wounded in the attack close to Syria's border with Turkey were seven Lebanese hostages held by the rebels since May. Four more hostages were said to be missing after the building they were in was hit. After unconfirmed TV reports that the four had died, rioters were said to have burned tyres on the main road to Beirut airport and an Air France flight switched routes to Jordan "for security reasons". Syrian rebels say the man they seized in Damascus was fighting for the Syrian government on behalf of Lebanon's Shia Hezbollah movement. A video of Hassan Salim al-Meqdad was released by his captors on Tuesday in which the captive, surrounded by three masked gunmen, says he was one of 1,500 Hezbollah fighters who arrived in Syria in early August. The statement was dismissed by his family - the al-Meqdad clan - as a lie. The BBC's Kevin Connolly in Beirut says the clan, who are thought to be heavily involved in smuggling, have been described as a family with a military wing. As the al-Meqdads threatened to carry out further abductions, the official Saudi news agency Spa quoted a foreign ministry official as saying Saudi citizens should avoid "travelling to Lebanon for their own safety". A UAE foreign ministry official said it issued its alert after the embassy "received information about UAE nationals being targeted and because of the difficult and sensitive circumstances in Lebanon", state news agency Wam reported. "Spreading chaos in the country will not bring about the liberation of hostages. On the contrary, chaos could cause [the hostages] harm and threatens the sovereignty of the state," the president said. Like Syria's other neighbours - Turkey, Iraq and Jordan - Lebanon has absorbed thousands of refugees fleeing from the conflict. Last week, former information minister Michel Samaha was arrested and accused along with two Syrian military figures of plotting to destabilise Lebanon and incite sectarian fighting. 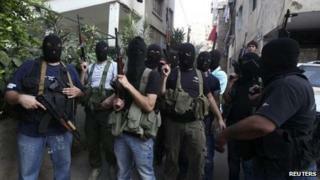 Tripoli - Lebanon's second city - has recently witnessed street gun battles between supporters and opponents of President Assad.